The Wii U bows out gracefully, if not to applause. Nintendo has updated its lifetime hardware sales figures following its most recent financials briefing. In doing so, it put the Wii U’s lifetime hardware sales through to the end of December 2016 at 13.56 million. That’s a comparatively small change from September 2016’s 13.4 million, and now that the Wii U has ceased production, it’s unlikely that figure will ever move much again. Compared to Nintendo’s other hardware products, the Wii U has really under-performed. Even the GameCube, the next-worst selling console, managed 21.74 million units sold. At the other end of the scale, the magnificent DS shifted 154.02 million units, putting it in a very close second place behind the beast PS2, which remains the best-selling console of all time. On the software side of things, Wii U has managed to shift 96.52 million units, which is an attach rate of about 7.1 games per console. That’s not bad at all, but no other Nintendo console has ever moved less than 200 million software units. 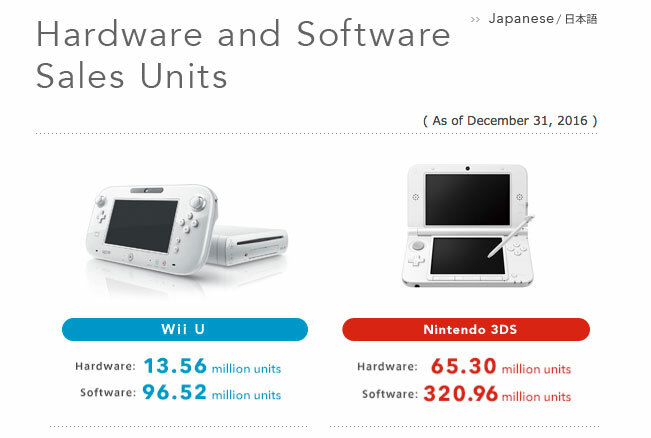 The 3DS also received updated hardware figures as Nintendo’s only other current hardware. Lifetime hardware sales have now passed 65.3 million units sold across the 3DS family, with software sales at 320.96 million. The Switch launches in early March to replace the Wii U, and while the 3DS is expecting support for at least a while longer, the hybrid nature of the console and Nintendo’s increasing affection for mobile means you might be able to get away with just one platform.